Paul Donovan recent bearish remarks for Bitcoin is an attempt to bury the top-ranking cryptocurrency for good. 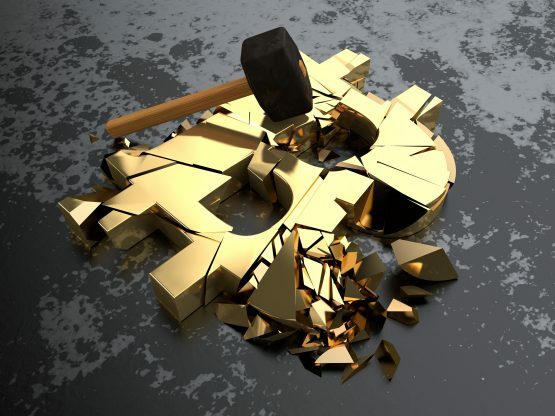 The Chief Economist believes that the top cryptocurrency is on the verge of falling apart completely, considering its latest price performance. Donovan added that one of Bitcoin’s primary obstacle was the government, stating that the idea of BTC replacing fiat was quite ambitious. Contrary to the above statement, this is not the first time BTC is experiencing a price crash. It always bounces back to a new high. Right from the start of the hike in late last year, it was fairly obvious that this was going to end badly, unfortunately, for some of the people who weren’t protected by any kind of regulation and got sucked into the process. Anthony Pompliano, however, recently stated that BTC was the best performing asset class in the last decade. The UBS executive went on to say that virtual currencies could not become currencies, either now, or in the future. Contrary to this statement, U.S. SEC chairman, Jay Clayton, stated that the leading cryptocurrency was not a security. Clayton further said that Bitcoin was a replacement for sovereign currencies including the dollar, euro, and yen. Furthermore, the leading digital currency has found success in supporting remittance corridors all across Southeast Asia and Africa. Donovan is, however, not the only vocal BTC critic right now. Oanda trader, Stephen Innes, recently stated that the leading cryptocurrency would plummet to $2,500 by January 2019. Vinny Lingham also added that Bitcoin price would remain between $3,000 and $5,000 till mid-2019. The current price action of the top-ranked cryptocurrency revealed a volatility return that was absent since Q2 2018. Bitcoin began its sudden fall by mid-November, to get to $5,600. Since then, the cryptocurrency has experienced volatile price swings. According to an earlier report, Bitcoin and other virtual currencies showed some bullish tendencies. The top cryptocurrency rose 5% within a few hours, with $4,300, positively dragging other altcoins. Bitcoin is currently struggling to stay at the $4,000 range, a significant decrease from its earlier price. Despite the wild price swings, some stakeholders are bullish on Bitcoin. The NYSE Chairman, Jeff Sprecher, described the leading virtual currency as a survivor, despite worst bearish situations. Chinese billionaire, Zhao Dong also predicted that Bitcoin price could reach $50,000 to $100,000 by 2021. Image courtesy of Shutterstock and Coinmarketcap.